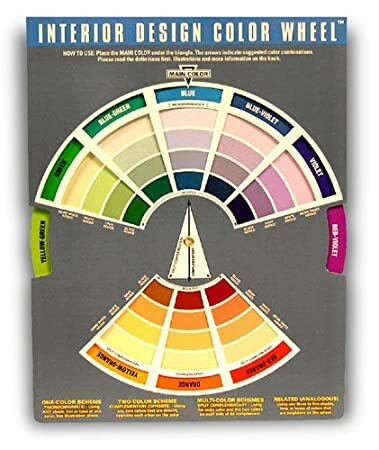 I thought that before this site gets much age on it that I should dedicate a post to the Color Wheel because the proper use of colors together makes all of the difference in whether a room feels “right” or feels “off” when we walk into it. When coordinating a decor of a room there really is a bit of a science to it all. It is not rocket science but there is a formula that works best no matter what colors you choose to use. Getting it correctly balanced will give you something to feel happy about and proud that you did on your own. Your room and its accessories will appear to have been done by a professional. So, lets look at the how and whys of colors that work together and colors that do not. You probably remember learning in elementary school that there are three primary colors: red, yellow and blue. From those three simple colors we can combine two to get our greens, oranges and purples. So, all a color wheel does is provide a visual of the spectrum of the colors with the mixtures of the primary and secondary colors and how they relate to each other. Take the color green for instance. An equal amount of the use of yellow and blue gives us green. Add more blue to the mixture and we have a blue green color. Put more yellow in than blue and we have a yellowish green. Pretty simple, right. The color wheel helps us see quickly the colors that are harmonious together. Blue on the wheel will have greens next to it on one side and purples next to it on the other side. If you wanted to see what colors would be complimentary to blue you would look at what is opposite the wedge of blue in the wheel which turns out to be oranges. Harmonious colors will give you an elegant and tranquil feeling while complimentary colors give a sense of balance and even excitement. It starts to get interesting once you begin to look at the hue and saturation of colors. At it’s purest a hue will be the equal mixture of two colors. Let’s use orange as an example. On the wheel the purest hue of it will be equal parts of yellow and red causing the fullest in saturation of the two primary colors. To tone it down a bit a small amount of white could be added. The more white added lessens the saturation of the two primary colors giving a lighter shade of the original. Adding colors like white, black or gray creates the tone of the color. More black or gray will give it a darker tone while more white gives it a lighter tone. Color has a temperature, too. Reds and oranges are associated with a warm feeling while blues create a cooler effect. That may be the first thing you should think about before choosing a color scheme for a room. How do you want it to feel? Cool or warm? From there you start to pick your colors. There are certainly ones that are more elaborate but one that is simple and easy to use for the beginner works very well. Once you get the hang of it, you could choose a more expensive one with more hues given. It is much easier to play around with the wheel than to purchase paints and accessories only to find out that they did not go so well together. Less expensive in the long run, too. Color wheels are really helpful, and artists use them all the time to figure out which colors are complementary. Seeing it in front of you makes it so much easier.